※The inner surface of equipment has no dead corner. It works at sealed state and conforms to the requirements of GMP. ※were evenly distributed within the group. ※Whole operation has strict safe protective measures. 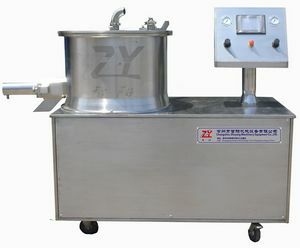 ※This machine makes damp granule into beautiful pellet by setting rotating centrifugal disk, blower, and pneumatic nozzle. 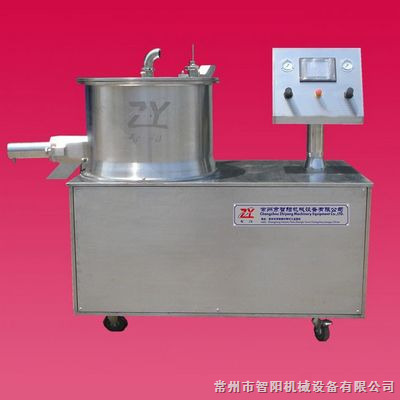 Feed damp granule into rotating centrifugal disk, start fan then start rotating centrifugal disk. 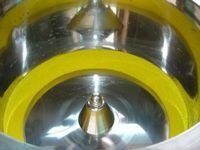 It can make the damp granule undertaken the action of air floating force in ring gap, rotating centrifugal strength and gravity itself, appear circle rope-turning movement and become high-degree ball shape pellet. *All datas are used for reference only. According to the condition of material, our factory has the right change but not notice, pardon!